Harlequins won the Anglo Welsh LV=Cup final and became LV =Cup champions when they beat Sale Sharks 14-32 at Sixways Stadium in Worcester on Sunday. London club Harlequins are still in the running for the Premiership title as well as the Heineken Cup title so the Anglo Welsh LV=Cup title is the first of a potential three titles. The victory means that Quins’ dream of claiming and unprecedented treble are still very much alive. The Aviva Premiership champions dominated from the outset and led through an early Ben Botica penalty, before Tom Williams pushed them further in front with a well-taken try in the Sharks’ corner in the ninth minute. Botica failed to convert and Sale struck back with a Danny Cipriani penalty, shortly afterwards, after Andy Powell went on a barnstorming run from the base of a scrum. Williams turned provider in the 26th minute when he launched an attack from deep inside his half which set up a scrum close to Sale’s five-metre line. 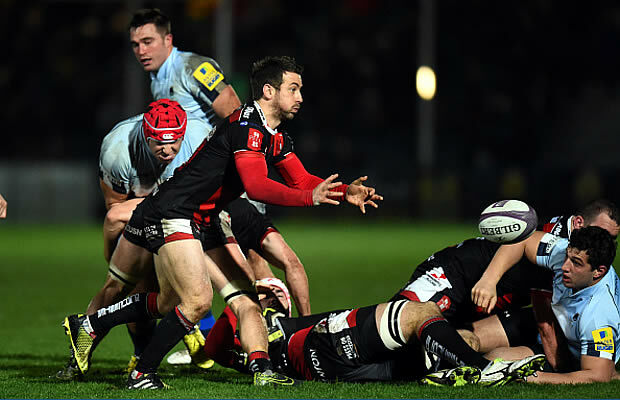 Tom Guest spotted a gap in the Sharks defence, at the set-piece, and barged over from close quarters. Botica converted, which meant Harlequins were leading 15-3, and he traded further three-pointers with Cipriani to give his side a deserved 18-6 lead at half-time. Cipriani succeeded with another penalty, after the break, but Quins struck back with converted tries from Tom Casson and captain Luke Wallace in the 44th and 53rd minutes respectively. Casson scored after he sold Powell an outrageous dummy and Wallace crossed the whitewash after another scrum close to the Sharks’ try-line. With the score at 32-9 Quins had the game in the bag but Sale kept on trying and struck back shortly afterwards when Johnny Leota scored, after combining well with midfield partner Sam Tuitupou, to give the underdogs a glimmer of hope. Although Sale had plenty of possession in the final quarter they could not add further points and the defeat extends their seven-year wait for a trophy. Quins’ triumph mean that they become just the second reigning Premiership champions to win the Anglo-Welsh Cup (LV= Cup), after London Wasps in 2006.